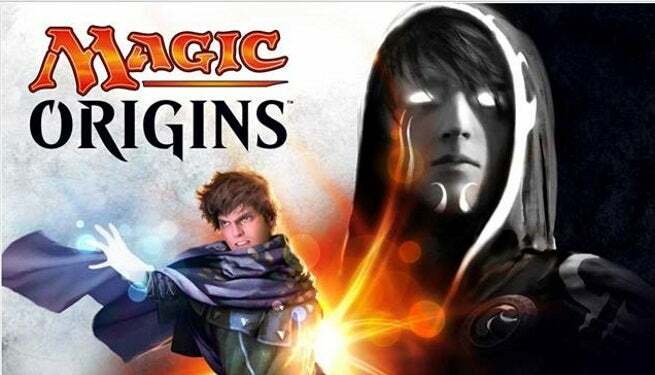 Spoiler season for Magic Origins continues! Last time, I looked at two new Commons in Green that look to improve upon that color's already impressive recent results. Today, I've got a brand new cycle at Common that emphasizes the concept of strength in numbers. In fact, each card is designed to get better in multiples. Relentless Rats, you've met your match! 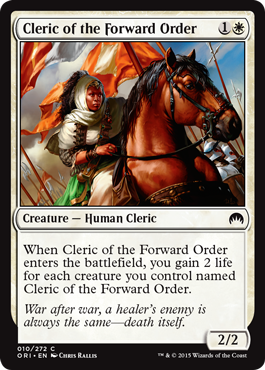 Cleric of the Forward Order is the latest iteration of a White creature that grants some incidental life when it enters the battlefield. In this case though, it's a 2/2 for 1W that grants 2 Life, a strict upgrade from Venerable Monk and its ilk. Not quite as good as Lone Missionary, but a huge upgrade from the surprisingly similar Tireless Missionaries, which cost twice as much for only one extra point of Toughness. And obviously if you manage to get just one more on the battlefield at the same time, the extra life gained is quite significant. Nonetheless, the best part about this card is that a 2/2 for 2 in White is practically playable all by itself. 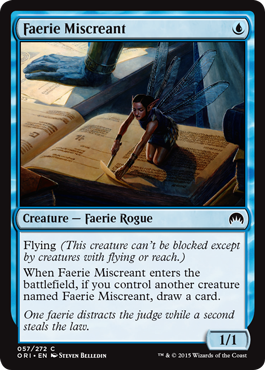 Faerie Miscreant is decidedly worse. Alone, it's just a 1/1 Flying creature for U, which isn't good enough at all to make the cut in Standard Pauper. You have to play a second one to get any value out the ability, which in this case is drawing an extra card. But unlike all the others, this doesn't really get better in multiples; no matter how many of these faeries you manage to get on the battlefield, you only draw a single card each time. If the first one drew a card itself, this might find a home in a heavy Blue control archetype. But as is, I don't imagine that this will see much if any play. A 1/1 for 1, even with Flying, simply isn't enough value. 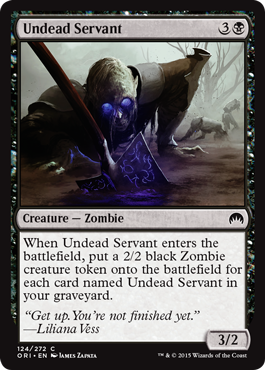 Undead Servant appears to be the closest thing we're going to get to Gravedigger at Common. Once more, the first one doesn't actually get any extra benefit, making it merely a 3/2 for 3B, which is pretty marginal. Then, you've got to actually get it into the Graveyard before you get any value from it when the next one enters play. On the other hand, if you manage to draw all four copies and get three of them into the Graveyard, on that last casting you're getting 3 2/2 Zombies, which is about as powerful an effect as you'll ever see at Common. The upside here is amazingly good, but the worst case scenario isn't that great. Still, I wouldn't be surprised if someone comes up with a way to abuse it. Next time, I'll take a look at the other two cards in this cycle. Thanks for reading. Do Bad Cards Need to Exist?